Nervous about taking standardized tests? Want to know how to study for final exams? 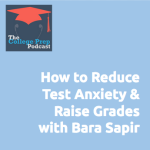 Learn from test prep expert Bara Sapir of Test Prep NY who gives tips on how to maximize scores and reduce test anxiety. Too often students and parents believe that adequate test preparation is about knowing the content. However, tests are also measures of how well the student takes tests in the first place. When they are studying, many students prepare the content but they forget to prepare their minds for the act of test taking. This is often what leads to testing anxiety, which can manifest in many ways: stomach aches, sweaty palms, and uneasy feeling, restless sleep or lack of sleep, a foggy mind, an overly speedy mind, and much more. 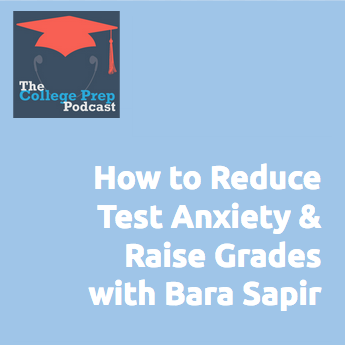 Bara discusses a surprising fact about why students often experience testing anxiety: at one point in their lives they learned that anxiety helps them do well on tests, and then this belief started unconsciously spiraling out of control. To counteract testing anxiety, it is helpful to re-align the mind, in much the same way that sports psychologists work with high performing athletes. Tune in to this week’s episode to hear Bara explain some specific strategies that parents can use with their younger students, and older students can use on themselves. Often in an hour or less, students can reduce or even eliminate test anxiety if they use the right combination of techniques. To access the free anti-anxiety resources available through Test Prep NY, click here.